One day earlier this month, with a few hours to spare after work, I wandered over to a little university museum in the city. In the first gallery was a modern art exhibition. In the second gallery, late-period Egyptian mummies. 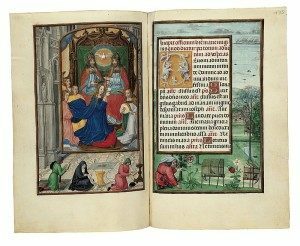 In the third, illuminated manuscripts from the Middle Ages. The contrasts were extraordinary… and even more so, I think, for someone who has been in the convent. Take, for example, the modern art set-up, which the explanatory plaque described as “an ongoing project concerned with representations of the self and the body,” designed to investigate “the stereotype of the artist as a creative genius.” To that end, the room was full of sculptures of the artist’s hands, paintings of her silhouette reduced to an inch in height, replicated thousandfold and scattered across a canvas like confetti, and, most disturbingly, a giant video screen in which her eyes, magnified to hundreds of times their normal size and (according to the information plaque) “god-like in their intensity,” slowly turn from black to white and back, over and over. Without blinking. This vividly demonstrates what happens when an artist has no higher reference point than the self – the gaze turns totally inwards in fascination. Some of the installments were okay (freaky eyes excepted) but I can’t quite fathom why the museum would be convinced that a giant mixed-media selfie is something the public needs to see. Upstairs, the Egyptian exhibition provided a very different view of the world. If the first display was a secular gaze inward, then this is an ancient, virtuous paganism with the gaze turned outward. 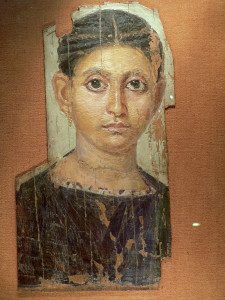 Art for them was not merely decorative, but crucial to eternal survival: a cartonnage mask that covers the head of a young woman’s mummy may be the only way that her wandering soul can find its way back to her body, and so every detail must be beautiful, accurate, and perfect. The love that these people, long before Christ, poured out upon the bodies of those they had lost – one tiny hand has its linen bandages overlapped diagonally up the wrist like origami, while a mummified foot in a soft leather sandal has every toe individually wrapped – is deep and palpable. 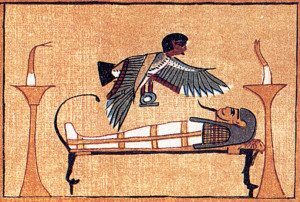 Without knowledge of the true God (the Hebrew Scriptures tend to be a little sour on the topic of Egypt and its deities), they knew of something greater than this present life, and prayed for the souls of their beloved dead according to the Natural Law written on their hearts (Romans 2:15). In the third gallery, across the hallway, was the illuminated manuscript exhibition that had brought me to the museum in the first place. 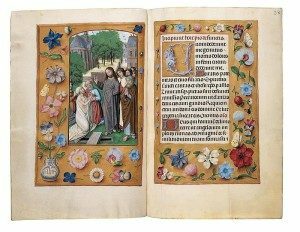 For a couple of hours, I wandered through several rooms full of intricately-decorated breviaries, giant books of chant notation that had been used by monks in choir, and laymen’s missals that would fit in the palm of one hand, tiny and bright as jewels. Of course, it’s possible to admire these books as works of art, but that would be to miss the point of them: to those who drew them line by perfect line, they were an offering to God and a way of showing the reverence due to His word – the artist’s gaze turned upward. Having been in the religious life, I understood, too, that each breviary was to the monk or nun who held it what my own, much simpler breviary was to me during my life in the convent: a rope that anchored my soul to the life of the Church. Incredibly, the exhibition also included a large fifteenth-century monastic choir book that visitors were permitted to touch – to turn the pages, to stroke the parchment, to lean in and breathe its dry, musty scent, and, in my case, to try and follow the rising and falling of the chant notations with half-remembered convent training. I asked the assistant why we were permitted to touch something so old without gloves, and she replied that parchment is much hardier than vellum and there’s no famous artist’s name attached to it to make it particularly important, and that for those reasons the coordinators of the exhibition had decided to take it out from behind the glass and put it into our hands as a tangible connection with the past. It was more than that, however. I was holding many lifetimes’ worth of devotion: every line was a five-hundred-year-old prayer by someone who had dedicated his life to God. Every page had been turned for centuries by others, young and old, who had been called to the same path of monastic dedication that I had tried to follow, to serve the same God I love. It occurred to me that we who have been in religious life are, in our generation, what they were in theirs. We understand them as they, I think, would understand us. And so, with my hands resting lightly on an anchor of prayer that they once held, I reached out to them – pray for us. You glorious souls in heaven, who have received the reward of your devotion – pray for us. Pray for those of us who live in a world you would not recognize, but seek a vocation that you would – pray for us. You holy souls in purgatory, who chanted these same prayers long ago, and now seek our prayers for your release – we have not forgotten you. We hear the echoes of your prayers, and we pray for you. May your souls, and the souls of all the faithful departed, rest in peace. And when at last you see Christ face to face, remember us, too, and pray for us. Pray for us. All you holy men and women, pray for us. Amen.